Mondi continues to benefit from the gains it made during South Africa’s apartheid regime. By Chris Lang. Published in WRM Bulletin 105, April 2006. Mondi was founded during South Africa’s apartheid regime in 1967, by Anglo American, one of the world’s largest mining companies. Mondi now has operations in 46 countries. With sales in 2004 of US$6.9 billion Mondi is the thirteenth largest pulp and paper company in the world. The company is a wholly-owned subsidiary of UK-based Anglo American, although recently Anglo American announced that it plans to list Mondi on the London Stock Exchange before the end of 2007. Mondi’s international expansion started in the early 1990s. Mondi has expanded through buying companies, mainly in Europe. By 2001, only about one-third of Mondi’s revenue was generated in South Africa. Over the last six years, Mondi has tripled its turnover. After a corporate restructuring in late 2004, Mondi’s operations are run by two companies: Mondi Business Paper and Mondi Packaging. Mondi Business Paper employs 17,000 people and incorporates Austrian paper company Neusiedler and Mondi South Africa. The company’s 16 paper machines have a total capacity of 2 million tons a year. Mondi Business Paper has pulp operations in Austria, Russia, Slovakia and South Africa and forestry operations in Russia, South Africa and Swaziland. The company manages about 400,000 hectares of plantations in South Africa and Swaziland. Mondi Packaging employs about 16,000 people and has about 120 production plants in Europe and 18 in the Americas, Asia and Africa. The company is the result of a merger of Austrian industrial packaging group Frastschach (which was already wholly owned by Anglo American) and the existing Mondi Packaging group. While generating profits for Mondi, the company’s expansion has often been bad news for workers. In 1996, Mondi bought shares in Swiecie, the largest pulp, paper and packaging mill in Poland. Under Mondi, annual production has increased from 450,000 tons a year to 737,000 tons a year, while profits increased from R25 million in 1996, to R65 million in 2002. Meanwhile employment fell from 3,300 to 1,500 people. In South Africa, Mondi has contracted out a large part of its workforce. This has had serious implications for workers. “Incomes are insecure and inadequate, there are no financial safety nets in the form of health insurance or pensions, and workers are exposed to risk of permanent injury that could further impair their ability to secure a livelihood in future,” note researchers Jeanette Clarke and Moenieba Isaacs in a recent report which documents problems for forestry workers. The report, which was carried out as a project with the International Institute for Environment and Development, concludes that forestry contracting jobs will not lift workers, who are mainly women, out of poverty or even prevent them falling further into poverty. 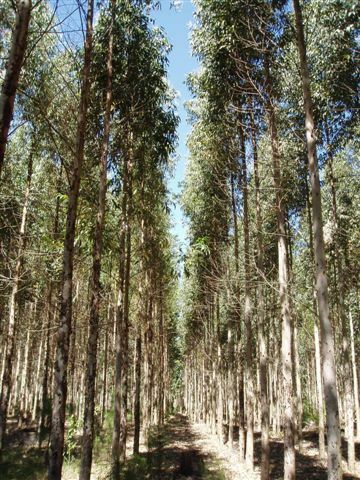 One of Mondi’s monoculture eucalyptus plantations – certified as well managed forest by FSC. Mondi’s plantations in South Africa and Swaziland are certified by Forest Stewardship Council as well managed. In September 2000, WWF announced that “Mondi has committed itself to responsible forestry management, for example by improving the quality of biodiversity conservation throughout its enormous forest estate”. Mondi also funds a wetlands conservation project, called the Mondi Wetlands Project. The project is run by South Africa’s two largest conservation organisations, WWF South Africa and the Wildlife and Environment Society of South Africa. In November 2005, South African NGO TimberWatch organised a meeting with local communities and NGOs in Mtubatuba, KwaZulu-Natal province. When asked whether there were any benefits to communities from plantations, none of the community representatives present could think of any benefits. “Since the plantations came, few people are employed. Farms have been destroyed. The impact from tree plantations has been very negative,” said one villager. “Plantations have caused starvation not benefits,” another villager added. The villagers produced a list of problems caused by industrial tree plantations, including a reduction in the availability of water, a reduction in grazing and arable land, a reduction in natural forest, fruit trees and medicinal herbs, damaged soils and the fact that plantations provide a hiding place for criminals. Under South Africa’s racist apartheid regime, black people lost all their rights, including rights to land. “Timber plantations have forced thousands of people off the land in the past, and continue to do so in the present time,” explains Wally Menne of TimberWatch. Mondi expanded its plantations in the 1980s, buying up hundreds of farms to become one of South Africa’s largest land owners. The white farm-owners took the money and moved away. Black farm workers received nothing and lost what little they had. Mondi’s paper mill at Merebank in South Durban is a classic example of environmental racism. During the apartheid regime, blacks and south Asians were forcibly relocated to South Durban to provide cheap labour for the oil, paper and chemical industries. Toxic chemical pollution from these industries means that South Durban is one of the worst examples of industrial pollution anywhere in the world. One in four South Durban residents suffers from asthma. 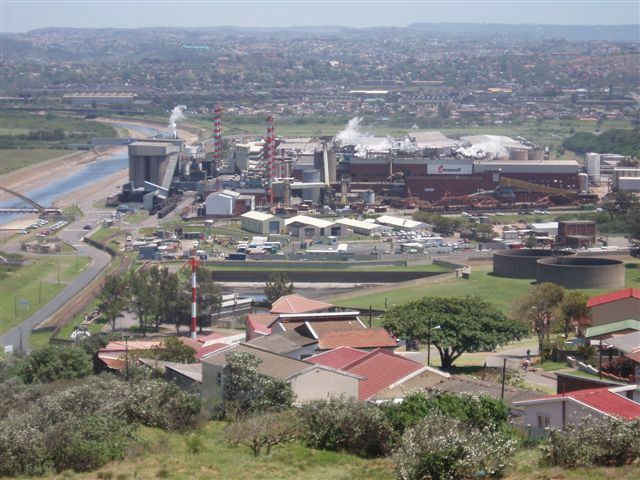 Mondi’s Merebank paper mill is built right in the middle of a South Durban housing estate. I visited South Durban in October 2005 and went on SDCEA’s “Toxic Tour”. The day I was there, the sky was blue and clear and a strong wind came from the sea, but Mondi’s paper mill still stank. According to the South Durban Community Environmental Alliance (SDCEA), Mondi is the third largest polluter in the area, behind two oil refineries. In 2003, Desmond D’Sa, SDCEA’s chairman, traveled to London to voice the community’s concerns at Anglo American’s AGM. For several years, the local community has opposed Mondi’s plans to build an incinerator at its Merebank mill. Rajah Naidoo, the chair of the Merebank Resident’s Association told the South African Sunday Times that the incinerator would result in more pollution in the area and could increase the high incidence of asthma and cancer in south Durban. “Message From David Hathorn, CEO Of The Mondi Group”, Mondi web-site. “Get the balance sheet right”, Pulp and Paper International, September 2005. “Andrew Thompson: Chairman, Mondi Brazil”, Moneyweb, Africa News, AllAfrica Inc., 4 October 2001. “David Hathorn: CEO, Mondi Europe”, Moneyweb, Africa News, AllAfrica Inc., 2 January 2002. “Paper and Packaging overview”, Anglo American web-site. “FSC Certified Forests”, Forest Stewardship Council, 13 September 2005. John Fraser, “Anglo to buy remaining 30% stake in Frantschach”, Business Day (South Africa), 6 April 2004. Janet Wilhelm, “New markets. A lucrative gateway to the EU”, Financial Mail (South Africa), 31 October 2003. Jeanette Clarke and Moenieba Isaacs “What role for forestry in reducing poverty in South Africa?”, May 2004. Available on the World Rainforest Movement web-site (but not published by WRM). “Anton Rupert, Sappi and Mondi honoured”, South African Press Association, 28 October 2000. “What is the Mondi Wetlands Project”, Mondi Wetlands Project web-site. I was present at the meeting on 5 November 2005, at the Hotel Paradiso in Mtubatuba. The quotations are based on a translation of what villagers said during the meeting. Wally Menne, “South Africa: Pulping people and places”, WRM Bulletin 83, June 2004. “Mondi to Push for Multifuel Boiler”, Business Day (South Africa), 11 July 2003. “Anglo, Shell Bow to Green Pressure”, Business Day (South Africa), 29 April 2003. Bongani Mthethwa, “Opposition mounts against Mondi incinerator plan”, Sunday Times (South Africa), 20 June 2004. “DBN pollution, Deputy environ minister tours”, South African Press Association, 13 March 2003. A version of this profile was first published in Alternativer Waldschadenbericht, by Urgewald, ARA, Forum Umwelt und Entwicklung, January 2006 (in German). I would like to know exactly how many people of South Africa are employed in the plantations of Mondi and where are those plantations located? @Jerry – thanks for your comment. I don’t know the current figures is the short answer, I’m afraid. You could try asking Mondi these questions. Let us now see a South African example: the multinational company MONDI, which is also one of the main shareholders of Aracruz Celulose. This company has a total of 638,000 hectares of land. Of this total, 407,000 hectares are plantations. In turn the company –again according to data in its web site– has 4,500 employees. Once again the results we obtain regarding employment generated by these multinational companies are low: in the case of MONDI, it is 1.1 employee per 100 planted hectares. If we consider the total hectares belonging to MONDI, the figure drops to 0.7 jobs per 100 hectares. And this in spite of the fact that MONDI also includes the figures of employees in its industrial sector, which shows a situation similar to that of Aracruz regarding the scarce generation of rural employment. N.B. This information is nine years out-of-date. Mondi sold its share in Aracruz in October 2001 and Aracruz is now called Fibria. A key question (which Mondi probably will not be able to answer) is: How many people derived their livelihoods from the land before it was converted to monocultures?